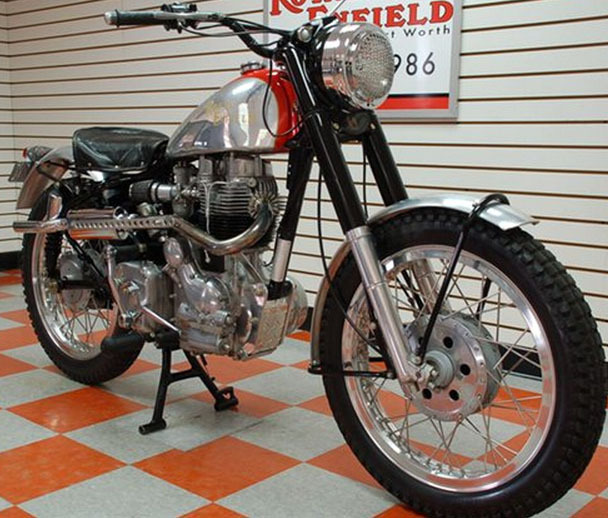 Here's a Royal Enfield trials motorcycle too pretty to get dirty. A dramatic looking 2000 Royal Enfield custom scrambler is for sale on eBay at MJ Sales Cycles in Fort Worth, Tex. The photos accompanying the ad show the care that went into this motorcycle and its aluminum bodywork kit. In fact, it's so pretty that the ad suggests that "this is a beautiful bike that is perfect for tooling around downtown or as a display in your office, pub, or game room." What about bashing about in the woods and mud? After all, what are the lower skid plate and headlight rock guard for? No, you probably wouldn't do that with this motorcycle and neither would I. It is a motorcycle meant to be appreciated with the eyes. I couldn't resist putting some of the pictures from the ad into a short slide show for you. yeah it's beautiful and everything. But I say, get out on some trails and get it dirty! That's what it is made for!